I did this with my 5th graders last year (I teach 3rd this year). After studying the Civil War, I wanted to integrate writing and reinforce the whole unit. We viewed replicas of Civil War letters, then the students created some of their own. They decided who they were going to be (some were nurses, some were soldiers, and a few were even women that pretended to be men in order to get in! ), and did their rough draft. After all the editing, they made "tea paper" by soaking copy paper in strong tea and letting it dry overnight. A few got creative and added a few touches of red marker ("blood"), brown along the edges (to make it look extra old), or tears in the paper. 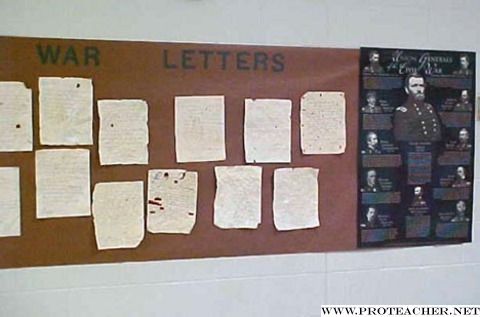 They wrote their final copy on the dried tea paper, and displayed them on brown bulletin board paper backing. I added a poster of Civil War figures at each end of the display. They received many compliments on their work!